We helped OceanSpray reach a large proportion of their overseas market with a multilingual web design that offered a great user experience. 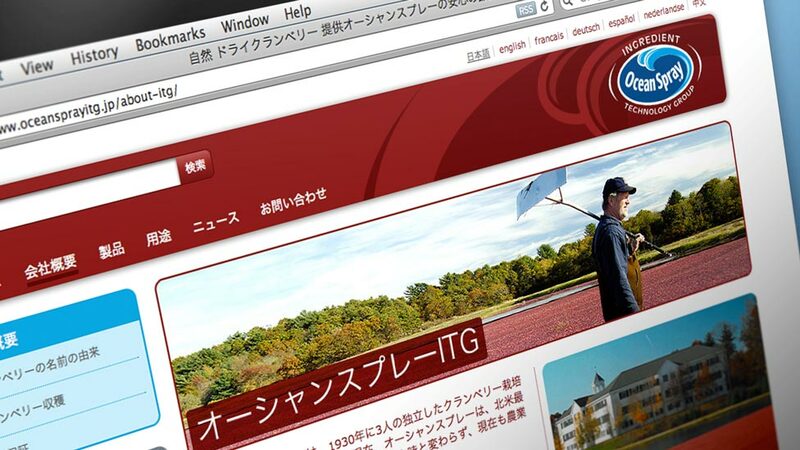 Ocean Spray Ingredient Technology Group (ITG) needed to provide a slightly reduced version of their main website in multiple languages. Their requirement was for easy-to-update multilingual web design that could be rolled out in several translations, with an effective SEO strategy and hosted in the respective countries. The multilingual website needed to mirror the main website we had completed a few months earlier, but rather than being a predominantly static site, built on a .NET platform, the new versions had to be fully content managed and built in PHP. Our solution centred around a very user-friendly content management system – WordPress – incorporating a totally bespoke theme built using CSS, PHP and HTML. The custom WordPress theme was built with multiple page templates and functionality to add all SEO, including image titles and alt tags, from within WordPress, whilst keeping the editable page content as simple as possible. Minimal styling or formatting of the content was required by the client from within WordPress – just plain text, images and any downloadable files – allowing the most effective method of producing the most trouble-free updating experience for our client. Produced in six languages – Spanish, French, German, Dutch, Japanese and Chinese – and consisting of approximately 24 pages per site, the WordPress multilingual web design has reached a large proportion of Ocean Spray’s overseas market. We produced a multilingual brochure design for Ocean Spray Ingredient Technology Group that enabled them to promote their message to a global audience in a professional and yet familiar tone.